Drive up to this home and the one acre lot will amaze you. It is private, away from the main highway, with plenty of space for toys, and plenty of space to play. Stroll to the top of the porch and enjoy the views of the mountains and the beautiful colors of the the river foliage and our enchanted sky. Step into this open concept, great room, and see the living room, dining area, family room and kitchen. The kitchen has corian counter tops and the appliances are all stainless steel. To the right are two bedrooms and a full bath. 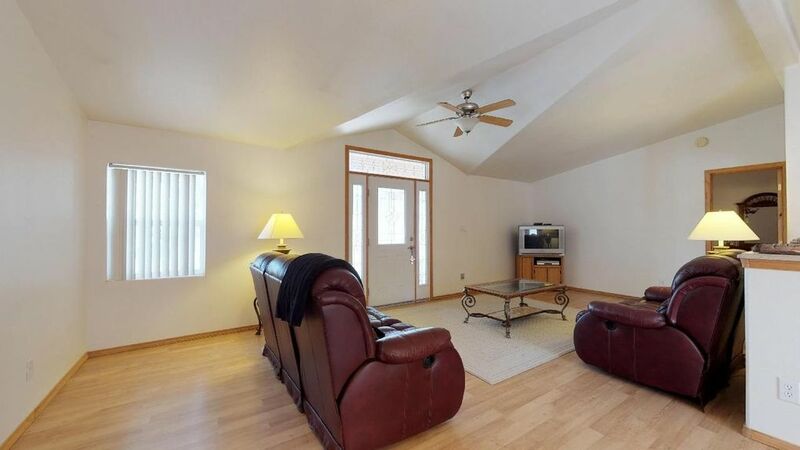 To the left is the first master suite with a good size closet and a nice size private bath. The laundry room is spacious, too. An incredible surprise, is an enormous media room/recreation room , whatever you would like it to be, is attached to another master suite. This master suite is massive and luxurious. There are double doors to exit the media/recreation room and the dining room, to what could be an awesome private outdoor living space. Seeing is believing, make an appointment to see this enormous, beautiful home, believe in yourself and make it yours. Enjoy the Video Link. Directions: From Santa Fe drive north on NORTH HWY 84/285 and continue through Espanola until you come to the junction where HWY 285 exits. You will continue on HWY 84 for about 3 miles and property will be on the left.